Britain’s biggest payday lender, Wonga, is teetering on the brink of collapse following a surge of customer compensation claims in recent weeks that could cause it to call in administrators. The short term loan provider has reportedly lined up Grant Thornton the accountancy firm, to handle a potential administration of the company should its board believe it is unable to avoid falling into insolvency. The report from Sky News said Wonga could appoint Grant Thornton as soon as this week. Do they have any high street shops or is it an online operation only? Looks like it might be online only: it is also tied into Cotswold furniture (online) under the paylater brand. It employs 500+ staff at various offices throughout Europe. Claire's about to go bump? Accessories chain Claire’s is reported to be considering closing some of its UK stores in a move which would put hundreds of jobs at risk. The High Street chain, which has its head office in Erdington, was talking to restructuring firms about “a number of options”. The chain has more than 370 stores in the UK, according to its most recent accounts. A spokeswoman for Claire’s said closing underperforming stores was “part of normal business practice”. According to the Press Association, one rescue plan being considered is a company voluntary arrangement (CVA) where some stores are closed and rents are reduced on remaining stores. Claire’s is the latest retailer to be hit by the tough trading conditions, which have led to the collapse of Maplin and Toys R Us. House of Fraser fell into administration before being bought by Sports Direct, while stores such as Debenhams, New Look and Homebase have had to close outlets in an attempt to remain profitable. The news comes days after Claire’s US parent company emerged from bankruptcy protection. The bankruptcy protection procedure in the US – known as Chapter 11 – is aimed at giving companies time to restructure their finances. Group chief executive Ron Marshall said the firm was now “a healthier, more profitable company”. Debenhams is understood to be seeking to close 50 of its 166 stores in a radical overhaul as it prepares to reveal a record £500m loss. The struggling department store chain has previously said 10 stores were earmarked for closure over the next five years but has raised that target. The retailer's survival plan, which was first reported by Sky News, will affect about 4,000 jobs. Debenhams, which declined to comment, reports annual results on Thursday. About 25 store leases are due to expire over the next five years, although the company will not necessarily want to close all of those outlets. 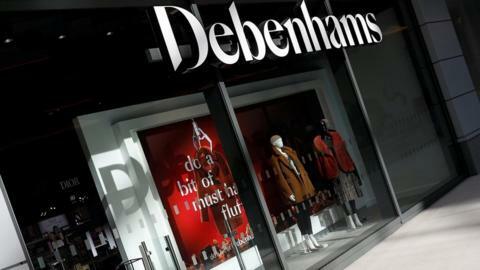 Debenhams will have to negotiate ending other leases with landlords, many of which may be reluctant to do so given the headwinds facing retailers. The chain has been under increased scrutiny since rival House of Fraser collapsed in August. Last month Debenhams sought to reassure investors about its finances after appointing KPMG to help improve its performance and maximise shareholder value. It said annual profits would be £33m - below previous guidance of £35m to £40m. It has issued three profit warnings this year and shares have fallen from 35p in January to just 8.5p, valuing the company at just over £100m. THE threat of Debenhams store closures has prompted a University of Warwick business expert to call for a review of taxes which advantage online retailers. Last week, the company announced it will shut down up to 50 stores in the UK, placing over 4,000 jobs at risk. The major high street retailer has branches in Coventry, Rugby, Leamington Spa and 166 across the country. A major store in the West Orchards Shopping Centre, Coventry, has for decades been a central part of the city centre. Professor of strategic management at Warwick Business School, Christian Stadler, is now warning of a high street crisis unless the government supports retailers. He said: “Debenhams is the latest in a long line of department stores to run into trouble as the decline of the high street continues, with more and more shoppers choosing to buy online. “The tax advantages that online businesses enjoy have to be addressed, otherwise iconic names like Debenhams will continue to face higher costs than its internet rivals and will struggle to compete. “The government has to decide whether it is prepared to stand by and watch the death of the high street and the loss of jobs that involves. “Politicians need to think about what city centres will look like, and what the environment will be like, if all the shops are gone and decide whether they want to give stores a leg up." SWEDISH furniture giant Ikea has announced 7,500 workers could be made redundant as part of a transformation plan. The firm says around 350 UK employees could be out of the jobs in the next two years. Chiefs at the Ingka Group, which owns Ikea, say the company will focus more on its digital capabilities and simplifying its business model to make it more convenient for customers. They say the changes will ‘secure the future’ of the company. The Ikea store in Coventry has been a central part of the city’s shopping district for a decade. The number of times I've heard that!